Ruth Garrett Millikan's mother, Eunice Peterson Garrett, was the first woman to obtain a Ph.D. in Geology from the University of Minnesota. 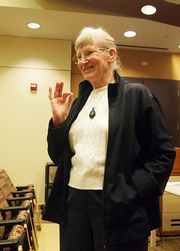 Prof. Millikan earned her Ph.D. at Yale University and became a well-known American philosopher of biology, psychology, and language, She taught at the University of Michigan and was named Distinguished Professor of Philosophy at the University of Connecticut, where she is now Professor Emerita. She is the author of six books, including Language, Thought, and Other Biological Categories (1984) and White Queen Psychology and Other Essays for Alice (1995) and On Clear and Confused Ideas (2000). Ruth Garrett Millikan is currently considered a "single author." If one or more works are by a distinct, homonymous authors, go ahead and split the author. Ruth Garrett Millikan is composed of 2 names. You can examine and separate out names.